Everyone has heard shocking stories about the transatlantic slave trade, but this was hardly the only type of slavery in which Europeans were engaged. The Pacific slave trade involved the forceful enslavement of Pacific islanders from the mid 19thcentury to the 20thcentury. This particular type of slavery is often referred to as “blackbirding”. The primary focus of “blackbirding” was to supply cheap labor to sugar-cane plantations on Pacific plantations, particularly in Queensland, Fiji, New Caledonia, and the Samoan Islands. This was mainly achieved through trickery and kidnapping. They were frequently deceived about the length of time for which they were “contracted” and the nature of their “contract”. If all this failed, the islanders were simply loaded onto slave ships at gunpoint. The captured islanders were collectively known as Kanakas, which means Person or Man in Hawaiian. These workers were essentially treated as slaves, but officially they were referred to as “indentured labourers”. There have been debates as to whether “blackbirding” was considered slavery, as the “labourers” were paid. Yet, it is worth noting that their wages were well below the wages of European workers. According to various studies, first-year workers received a standard pay rate of six pounds per year. The pay rate was also fixed for 40 years without taking inflation into account. As slavery had already been outlawed by the British Empire, the minimal pay was used to justify the practice. “Blackbirding” can be seen as a euphemism, because the captured workers still worked in slave-like conditions. A person recounting their grandfather’s story explains how “[he] was told that once they were here, they were unable to speak their mother language, they were punished in terms of corporal punishment.” They were also segregated from wider society just like African American slaves were in the US. In 1872 the British Parliament introduced the Pacific Islanders’ Protection Act which outlawed “blackbirding”. Yet, the practice still continued until the early 20thcentury. The Act did provide for agents on British recruiting vessels, leading to stricter licensing procedure, and patrol of British-controlled islands. The Pacific Islands weren’t the only area where “blackbirding” took place. The practice was also common in the United States after slavery was banned. Many US citizens used the Reverse Underground Railroads to capture free African-Americans and fugitive slaves and tricked or sold them into slavery. 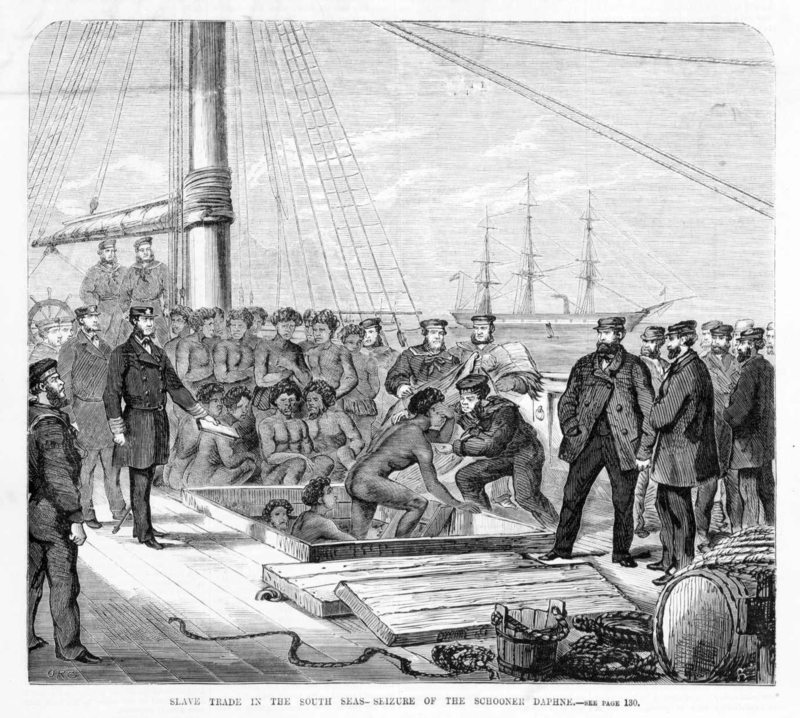 This practice in the United States was also known as “blackbirding” and relied on the same type of coercion and trickery. People of African or mixed ancestry frequently took part in these actions. While some worked for white employers, others helped slave owners with finding escaped slaves. For many tricking their fellow African-Americans was not a choice, but a necessity to survive. For their help they would receive a bounty. Their actions also resulted in more successful kidnappings, as “blackbirding” largely relied on developing a connection between the hunter and their target and for ex-slaves it was easier to trust a fellow African-American person. In 1807 Britain passed the Abolition of the Slave Trade Act and in 1862 Lincoln signed the Emancipation Proclamation, but this was hardly the end of slavery. “Blackbirding” was simply one of the many ways in which people circumvented official laws to continue profiting from slavery.